Join Us!!! We are looking for someone to help us cover Guatemalan basketball. Please send us an e-mail. 26-year old Freddy Fernandez (197-C/F-92) had a great game in the last round for VILLA NUEVA and receives a Interperformances Liga Metropolitana Player of the Week award for round 14. He had a double-double of 21 points and 11 rebounds, while his team outclassed, the league's bottom-ranked team La Villa (#10, 0-5) with 41-point margin 99-58. Villa Nueva is placed at 5th position in Guatemalan Liga Metropolitana. Villa Nueva is a typical solid league team placed somewhere in the middle or a little bit lower in the standings. They need more victories to improve their 3-4 record. Fernandez turned to be Villa Nueva's top player in his first season with the team. Fernandez has impressive league stats. He is in league's top in points (7th best: 18.8ppg), rebounds (8th best: 8.2rpg) and averages solid 55.3% FGP. 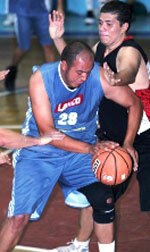 Second best performed player last round was Alejandro Carrillo (178-G-88) of Villa Nueva. He is a guard in his 2nd season at Villa Nueva. In the last game Carrillo recorded impressive 19 points and 9 rebounds. Of course he led Villa Nueva to another comfortable win outscoring La Villa (#10, 0-5) 99-58. This victory allowed Villa Nueva to move up to 5th position in the standings. His team is not often considered as one of the league's best with a mere 3-4 record. Carrillo is well-known at Villa Nueva and he already established his position as one of the team's leaders. Third place about best performers goes to another Villa Nueva's star - Bernand Chavarria. Chavarria showcased his all-around game by recording 19 points, seven rebounds and four assists in the last round. He was another key player of Villa Nueva, helping his team with a 99-58 easy win against La Villa (#10, 0-5). The chances of Villa Nueva ranking at the top of the league, however are very questionable as they have already lost 4 games, recording just three victories. With bigger assistance of his teammates, Chavarria could help Villa Nueva to bring them higher in the standings. has a great season in Guatemala. After only 3 games, he made it on the list of the league's leaders in points with 11.7ppg (best scorer), rebounds with 8.3rpg (#1 in league) and assists with 2.7apg (best passer). Center Bernie Diaz (200-C-81) had a very impressive game in the last round for top-ranked ELOHIM, receiving a Interperformances Liga Metropolitana Player of the Week award for round 20. The 37-year old player had a double-double of 23 points and 10 rebounds, while his team outclassed Villa Nueva (#7, 2-8) with 50-point margin 84-34. It allowed ELOHIM to consolidate first place in the Guatemalan Liga Metropolitana. ELOHIM has a very good season and are considered to have a run for the championship title. They improved their record to 9-1. In the team's last game Diaz had a remarkable 83.3% from 2-point range. It's his second year at ELOHIM and it's hard to imagine this team without him. Bernie Diaz has solid league stats. He is in league's top in points (2nd best: 22.9ppg), rebounds (9th best: 8.9rpg) and averages impressive 73.1% FGP. The second best player in last round's games was young Joshua Sandoval (98) of Club Force. Sandoval had a very good evening with 16 points, 2 rebounds and 6 assists. Bad luck as Club Force lost that game 63-80 to slightly higher-ranked Laminas C. (#3, 7-3). This loss caused Club Force to drop to 5th position in the standings. His team lost some distance to top teams. But 5-5 record is not bad and everything may still change. Sandoval is well-known at Club Force and is a proven leader in his second season with the team. 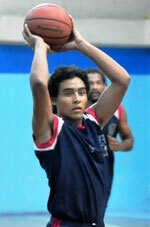 Third on the list of top players last round was another ELOHIM's star - Salvadorean guard Ricardo Amaya (191-G-84). Amaya showcased his all-around game by recording 12 points, ten rebounds and four assists in the last round. He was another key player of ELOHIM, helping his team with a 84-34 easy win against the lower-ranked Villa Nueva (#7, 2-8). Many experts and fans count ELOHIM as a contender for championship title. Another victory and another confirmation that they may be right. Just look at their record: 9 victories and only one lost game. They are currently at the very top of the standings. Amaya has a very solid season. In 9 games in Guatemala he scored 13.3ppg. He also has 7.9rpg and FGP: 52.0%. Ricardo Amaya has also Guatemalan passport and can play in the league with a status of domestic player. One of their biggest challengers host Club Force (5-5) lost to third ranked Laminas C. (7-3) 80-63. The guests trailed by 4 points after first quarter, but they stormed back to get the 4-point lead at the halftime and eventually won the game 80-63. Laminas C. outrebounded Club Force 42-28 including a 32-17 advantage in defensive rebounds. They looked well-organized offensively handing out 22 assists. Worth to mention a great performance of guard Mynor Aquino (175-89) who helped to win the game recording a double-double by scoring 10 points, 11 rebounds and 6 assists and swingman Rodrigo Vallejo (-88) who added 17 points and 5 rebounds during the contest. Laminas C.'s coach used a ten-player rotation which allowed the starters a little rest for the next games. Forward Hector Chur (179) responded with 18 points, 8 rebounds, 5 assists and 5 steals. Laminas C. maintains third position with 7-3 record having just two points less than leader ELOHIM. Club Force at the other side keeps the fourth place with five games lost. They share the position with Pampichi. Laminas C. are looking forward to face league's second-placed USAC in Guatemala in the next round and it will be for sure the game of the week. Club Force will play on the road against Villa Nueva and is hoping to prove to their fans that the loss was just an accident. Liga Metropolitana top team - ELOHIM (9-1) had no problems winning another game. This time they crushed seventh ranked Villa Nueva (2-8) in Chimaltenango 84-34. The winners were led by center Bernie Diaz (200-81) who had that evening a double-double by scoring 23 points and 10 rebounds (on 11-of-14 shooting from the field) and Oscar Salguero supported him with 16 points and 10 rebounds. ELOHIM's coach felt very confident that he used 10 players and allowed the starting five to rest. Even 10 points and 5 rebounds by Carlos Cruz did not help to save the game for Villa Nueva. ELOHIM have an impressive five-game winning streak. They maintain first position with 9-1 record. Villa Nueva at the other side keeps the seventh place with eight games lost. ELOHIM will have a break next round, and it should allow them to practice more before next game. Villa Nueva will play against Club Force (#5) and it may be a tough game between close rivals. One of their biggest challengers host Club Force (5-5) lost to third ranked Laminas C. (7-3) 80-63. The guests trailed by 4 points after first quarter, but they stormed back to get the 4-point lead at the halftime and eventually won the game 80-63. Laminas C. outrebounded Club Force 42-28 including a 32-17 advantage in defensive rebounds. They looked well-organized offensively handing out 22 assists. Worth to mention a great performance of guard Mynor Aquino (175-89) who helped to win the game recording a double-double by scoring 10 points, 11 rebounds and 6 assists and swingman Rodrigo Vallejo (-88) who added 17 points and 5 rebounds during the contest. Five Laminas C. players scored in double figures. Laminas C.'s coach used a ten-player rotation which allowed the starters a little rest for the next games. Forward Hector Chur (179) responded with 18 points, 8 rebounds, 5 assists and 5 steals and Joshua Sandoval (-98) scored 16 points, 6 assists and 4 steals. Laminas C. maintains third position with 7-3 record having just two points less than leader ELOHIM. Club Force at the other side keeps the fourth place with five games lost. They share the position with Pampichi. Laminas C. are looking forward to face league's second-placed USAC in Guatemala in the next round and it will be for sure the game of the week. Club Force will play on the road against Villa Nueva and is hoping to prove to their fans that the loss was just an accident. Liga Metropolitana top team - ELOHIM (9-1) had no problems winning another game. This time they crushed seventh ranked Villa Nueva (2-8) in Chimaltenango 84-34. ELOHIM held Villa Nueva to an opponent 17.9 percent shooting from the field compared to 48.0 percent accuracy of the winners. ELOHIM forced 24 Villa Nueva turnovers. Their players were unselfish on offense dishing 22 assists comparing to just 8 passes made by Villa Nueva's players. The winners were led by center Bernie Diaz (200-81) who had that evening a double-double by scoring 23 points and 10 rebounds (on 11-of-14 shooting from the field) and power forward Oscar Salguero (198-87) supported him with 16 points and 10 rebounds. Four ELOHIM players scored in double figures. ELOHIM's coach felt very confident that he used 10 players and allowed the starting five to rest. Even 10 points and 5 rebounds by Carlos Cruz did not help to save the game for Villa Nueva. Miguel Giron (-95) added 7 points and 7 rebounds for the guests. ELOHIM have an impressive five-game winning streak. They maintain first position with 9-1 record. Villa Nueva at the other side keeps the seventh place with eight games lost. ELOHIM will have a break next round, and it should allow them to practice more before next game. Villa Nueva will play against Club Force (#5) and it may be a tough game between close rivals. 28-year old swingman Miguel Gonzalez (187-G/F-90) had a great game in the last round for second-ranked USAC and receives a Interperformances Liga Metropolitana Player of the Week award for round 19. He had a double-double of 16 points and 12 rebounds, while his team crushed, the league's bottom-ranked team URL (#8, 0-10) with 17-point margin 84-67. USAC maintains the 2nd position in Guatemalan Liga Metropolitana. They are still close to the very top. USAC would have been even better if they kept winning the games like in the last round. They have a solid 8-2 record. In the team's last game Gonzalez had a remarkable three three-pointers out of 7 attempts. It's his second year at USAC and it's hard to imagine this team without him. Gonzalez has impressive league stats. He is in league's top in points (3rd best: 22.6ppg), rebounds (6th best: 9.6rpg) and averages solid 3.4spg and 51.5% FGP. Second best performed player last round was Carlos Chavez (191-F-89) of Pampichi. He is former international forward in his first season at Pampichi. In the last game Chavez recorded impressive 27 points and 7 rebounds. It was enough for Pampichi to edge slightly lower-ranked GMS (#6, 4-6) by 1 point 77-76. This victory allowed Pampichi to move up to 4th position in the standings. His team's 5-5 record is not bad at all. Chavez is one of the most experienced players at Pampichi and has a reputation of one of team's most reliable players. He belongs to the best scorers in the league with 15.0ppg (#9). He also registered 8.1 boards per game. Third place about best performers goes to another Pampichi's star - guard David Goddard (185-G-89). Goddard showcased his all-around game by recording 22 points, eight rebounds and seven assists in the last round. 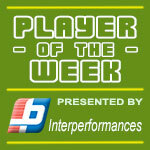 He was another key player of Pampichi, helping his team with a 77-76 win against slightly lower-ranked GMS (#6, 4-6). Pampichi needs these victories very badly if they think about getting closer to top teams. Their record at this point is 5 victories and 5 lost games. Goddard has a great season in Guatemala. After 10 games, he made it on the list of the league's leaders in points with 19.4ppg (5th best). David Goddard has also Guatemalan passport and can play in the league with a status of domestic player.